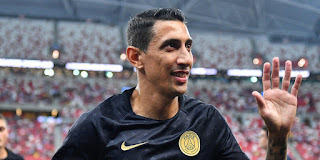 Arsenal, in a bid to make their already steaming side a ruthless one are eyeing a January move for Angel Di Maria, according to reports in France. The former Real Madrid and Manchester City star has reportedly hinted at a move back to a Premier League side, one that will be able to meet his wage demands of £200,000-a-week. The Gunners under Arsene Wenger had the opportunity to make him an Emirates Stadium faithful at a time but the hindrance was his huge wage package and it is still unknown if they will be willing to give him that now. It is said that Manchester United want their former player back and will be ready to battle it out with anyone including Unai Emery who longs to see the midfielder work with him again after their spell together at Paris Saint Germain. The positive atmosphere at the club currently should make it easy for Arsenal to lure any player to join them in as much as they would break the bank for his signature. Considering the age of Di Maria, would you love to see him in a red and white shirt? We want your opinions to see if they tally with those of some fans who are critical of this move as they feel a 30-year-old player is not what we need to go for right now. For me, age does not really matter as long as it will help us win trophies, or of what use is a youthful fresh-blooded team with no silverware. ?